Unroll pie crust onto cooking parchment or wax paper. Brush a small amount of coconut milk onto dough (just enough to moisten it). Sprinkle 1/2 tablespoon of the toasted coconut evenly on dough, then press it lightly into dough, just enough to make it stick. 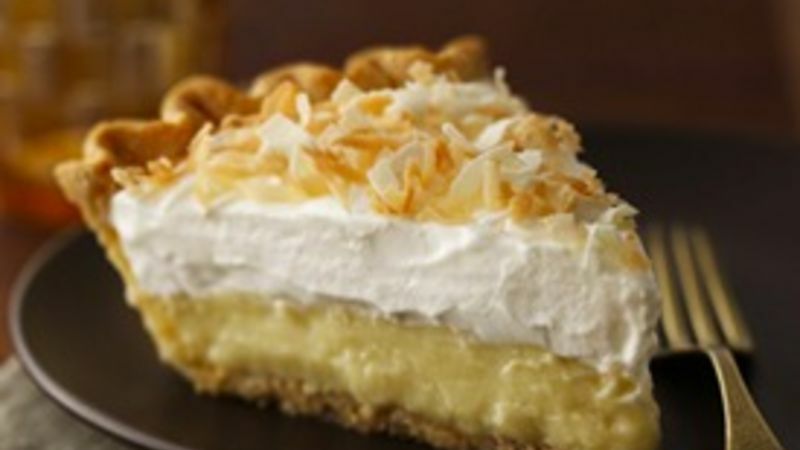 Sprinkle 1/2 tablespoon toasted coconut onto bottom of 9-inch pie plate, then form dough into plate. Pierce bottom and side with fork. Bake 10 to 12 minutes or until light brown. Cool. Heat the remaining coconut milk, the whole milk, 1/2 cup toasted coconut, vanilla bean, 1/3 cup of the sugar and the salt to a simmer in 2-quart saucepan over medium heat, stirring occasionally with a wooden spoon, about 5 minutes to dissolve sugar. In a separate large bowl, with whisk, beat the egg yolks, remaining 1/3 cup sugar and the cornstarch until well combined. Gradually beat the simmering liquid into the yolk mixture to temper it, then return the entire mixture to saucepan, scraping the bowl with a rubber spatula. Discard vanilla bean. Heat the mixture to a simmer over medium heat, beating constantly with whisk, 5 to 6 minutes or until mixture is thickened. Remove from heat; beat in the coconut extract and butter. Pour into the cooled crust; press a sheet of plastic wrap directly on the surface of the filling and refrigerate until the filling is cold and firm, at least 3 hours or overnight. Just before serving, beat the cream and sugar in a chilled bowl using electric mixer at medium speed until soft peaks form. Add the rum and continue to beat until slightly stiff peaks are formed. Spread or pipe the whipped cream over the chilled filling. Sprinkle 1/4 cup toasted coconut and shaved chocolate over the top. Store in refrigerator.